I'm on a sock knitting roll. Back when I used to knit when I was younger I never really knit anything more than scarves and afghans. I never tried any fancy patterns. Why? I really don't know, I've been missing out. I'm not really sure what got me into knitting socks recently. I knit a hat for my boyfriend and after that I decided for some unknown reason to knit a pair of socks. My first pair was a very simple design, no fancy pattern, very basic, which was a good idea for my first sock. There are a lot of steps that you should really get down before getting into anything more complicated. After I got that first pair of socks down I wanted to do more. Being confident with how to knit socks, I decided I would try a more complicated pattern. I joined Ravelry, a big knitting community where you can keep track of all your projects, yarn, patterns, etc. I found a lot of neat patterns on the site that I wanted to knit. Socks of Kindness was my first choice and I think they turned out pretty good. 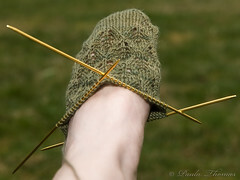 I tried a different method for the heel which I liked a lot. I also learned some things and will do them differently in the future. I'm now on my third pair of socks. I'm using some yarn I got off of Craigslist for a bargain. I'm knitting these starting with the toe rather than the cuff like the other two I did. If you are knitting with 2 skeins of yarn rather than 1 I think this is the best way to do them that way you can just keep knitting the sock until you run out of yarn and then start the 2nd one with the other skein so there's no guessing on how long you should make it if you start with the cuff. I have enough yarn to make about 9 more pairs of socks and already have patterns picked out for what I want to make with them. It should keep me busy for most of the year. I estimate I'll be able to do at least one pair of socks a month if I keep at the pace I'm going now. knitting is meditative. On my to-learn list. I've read a lot on blogs where people knit one sock and don't finish the other. I can't imagine doing that. It would make me crazy to only have one sock.